MOCOA, Colombia (AP) — Lines of people quietly walked the streets of Mocoa, followed by hearses carrying coffins to a cemetery where open graves waited. The survivors of the deadly flood that washed through this city in southern Colombia were burying their loved ones Monday after authorities began to release the remains recovered from a disaster that has shaken the country. 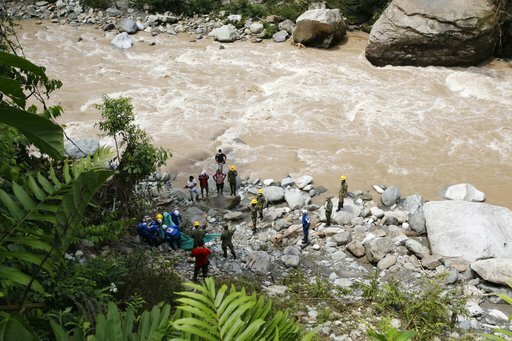 Colombian authorities said at least 273 people were killed when rivers surrounding Mocoa overflowed and sent a wall of water and debris surging through the city over the weekend. The death toll was expected to rise since many more were missing and bodies are still being found. Danilo Garzon Garcia, a 22-year-old resident of the city, had spent the previous day searching with other family members for his young sister. They finally found her body at the local hospital, able to recognize her battered remains because of her underwear. 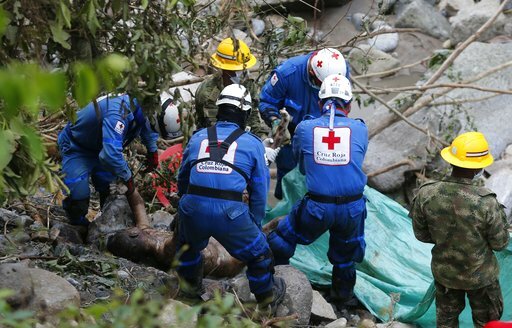 The Colombian Red Cross said it has received 374 requests for help from families unable to locate loved ones, people whose whereabouts were still unknown three days after the disaster. Much of Mocoa was still strewn with rocks, tree limbs, and brown muck. Search and rescue teams continued to probe piles of debris whenever someone heard a possible sound of movement. Many in this city of around 40,000 people still seemed in shock from the flood, which poured through the town after a punishing rainfall as people slept late Friday night and early Saturday. “We do not like to create false expectations but where there is a possibility of life we will do everything possible,” said Carlos Ivan Marquez, director of Colombia’s National Unit of Disaster and Risk Management. Many victims were young like Garzon’s 14-year-old sister. “She had gone to sleep at a friend’s house. When we got to where the house was we didn’t find anyone,” he said. As he walked calmly in the funeral procession, his mother sobbed and screamed in grief: “Leidy! What did you leave me? Leidy, my girl.” Her son then put his arm around her as they made their way to the cemetery. President Juan Manuel Santos and other officials pledged emergency relief and said that Mocoa would be rebuilt, including a new water system to replace the one damaged in the flood and new homes for those in the 17 neighborhoods hit hardest by the surging water. He said he had spoken by phone with U.S. President Donald Trump, who promised assistance, as have other nations including China and Venezuela. Santos also declared an “economic, social and ecological emergency,” a designation intended to speed reconstruction efforts. “We are not going to stop until everyone affected by this natural disaster receives help,” Marquez said. Associated Press writer Cesar Garcia contributed from Bogota, Colombia.